To judge from the "What's This Mushroom?" 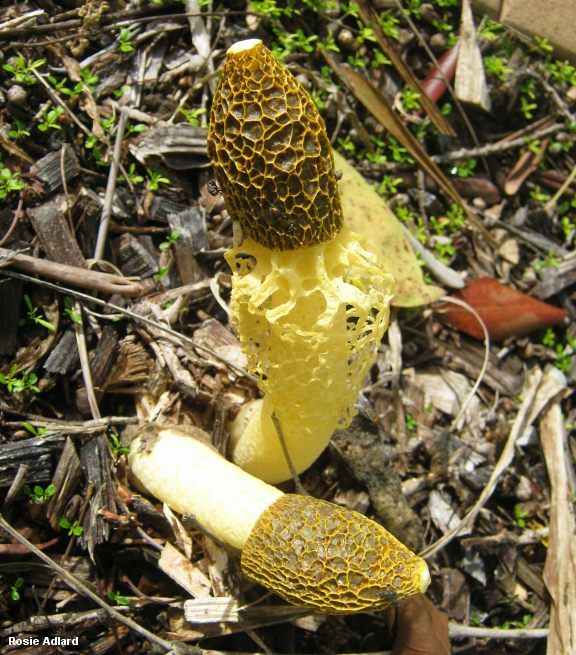 e-mails I receive from down under, this mushroom is one of the more common stinkhorns of Australia, along with Colus pusillus. 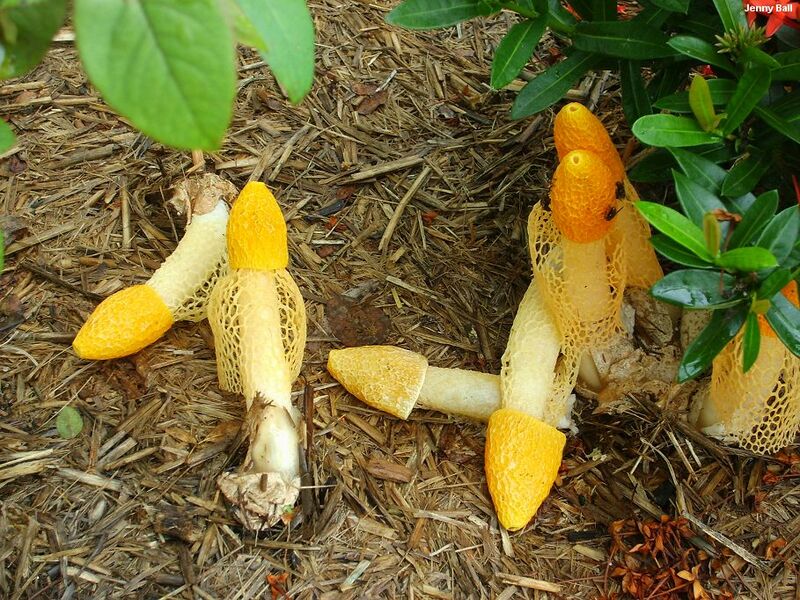 Phallus multicolor is a cousin of Phallus indusiatus that features a lemon yellow head (visible once flies have removed the brown spore slime) and a beautiful lemon yellow skirt. The skirt is a bit shorter than the skirts of Phallus indusiatus or Phallus cinnabarinus--but a bit longer than the skirt of Phallus duplicatus. Ahh, the intricacies involved with sorting out the skirt-wearing phalluses of the world . . .
Dictyophora multicolor is a synonym. 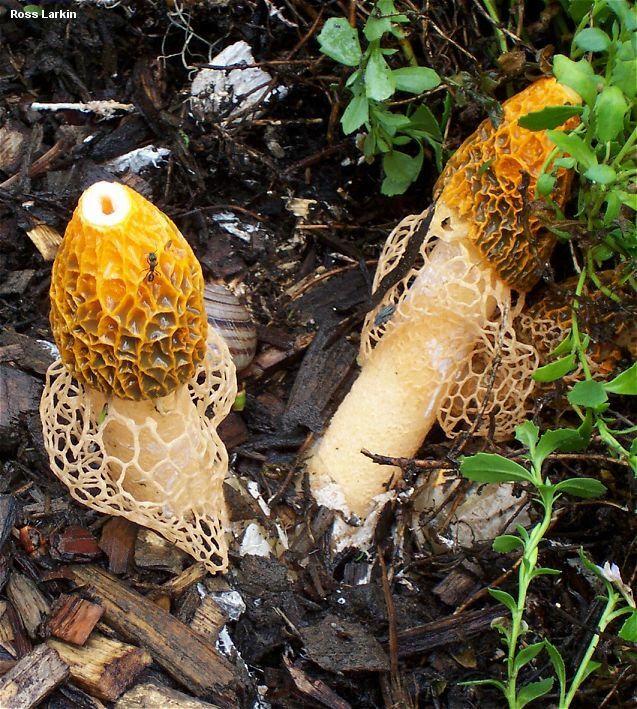 Ecology: Saprobic; growing alone or gregariously in woods and in urban settings (gardens, woodchip beds, and so on); year-round; Australia, New Zealand, and Hawaii (old records from Asia probably represent Phallus cinnabarinus). 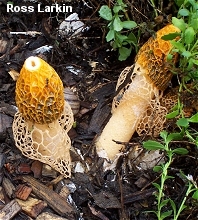 Immature Fruiting Body: Like a whitish to brownish "egg"; when sliced revealing the stinkhorn-to-be encased in a gelatinous substance. 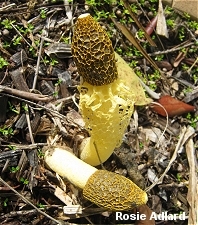 Mature Fruiting Body: Spike-like; to 16 cm high and 3 cm across; with a cap that is pitted and ridged by maturity, and covered with a slimy, olive-brown substance that eventually wears off (or is carried away by flies), exposing a lemon yellow to yellowish surface; often developing a perforation at the top; with a white to pinkish stem that arises from a white to pinkish or purplish, sacklike volva; with a laced, lemon yellow to yellowish "skirt" hanging from the bottom edge of the cap to about halfway down the stem's length; odor unpleasant or strongly sweet. Microscopic Features: Spores 3.5-4.5 x 1.5-2 µ; long-elliptical to nearly cylindric. REFERENCES: (Berkeley & Broome, 1882) Cooke, 1882. (Saccardo, 1888; Cunningham, 1944/1979; Calonge, 2005; Hemmes & Desjardin, 2009.) I have not collected this mushroom.